Your toilet wax ring is a very simple device (and only about $5.00 at Home Depot), but it is responsible for keeping your feet dry when you flush the commode. It also serves another important duty — it seals your home against the intrusion of putrid sewer vapors. 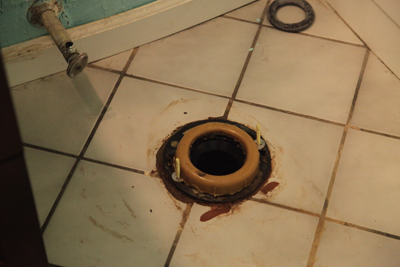 The photo above shows a ring mounted in the floor flange. This is one that I just replaced recently. How long will the job take? If you havent tackled this job before and everything goes smoothly, about 3 to 4 hours. 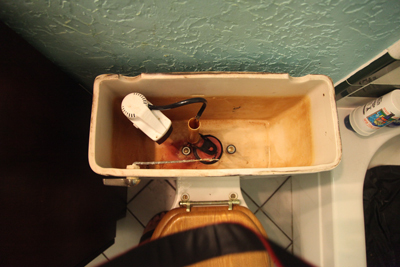 The hardest part of the job is lifting the toilet of the flange; thats a lot of porcelain! A large sponge and a bucket. A very large plastic lawn trash bag. Reinforced wax bowl ring with new flange bolts. The reinforced ones have a supportive plastic ring inside the wax that mates with the floor flange. You can use the old style, but I wouldnt recommend it. Tank-to-bowl gasket and bolts (your gasket may be in good shape and reusable, but you will probably need new bolts along with the fiber washers). The first thing to do is valve off the water supply by turning the valve handle all the way clockwise. Next flush the toilet. This will get rid of most of the water although not all. Remove the tank lid and put it somewhere out of the way. Use your sponge to remove all the water left in the tank and bowl. Now, spread the trash bag out in the bath tub. This is where the tank and bowl will reside while you work on the flange. Unscrew and remove the water supply line at the valve. You might want to put a rag or cup under the line to catch any residual water in it. More prevention equals less cleanup. Start by removing the two brass bolts that connect the tank to the bowl using the screwdriver and wrench. Note their location in the photo above, on either side of the fill tube/flapper in the center of the tank. Use the putty knife to be sure the areas where the bolt heads seat are smooth so you get a good seal. You only want to disassemble once. 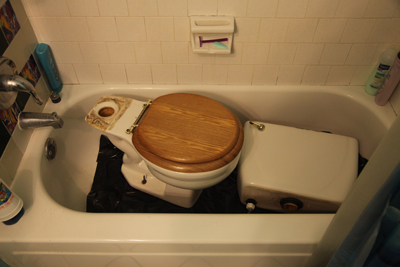 Remove the tank and carefully lay it on the plastic bag in the tub. Inspect the gasket on the bottom of the tank. If its in good shape, leave it. If not, remove it because you will have to get an exact match at the home improvement store. Next, remove the nuts bolting the base of the bowl to the floor flange. Lift the bowl off the flange and carefully lay it on the plastic bag. Use the putty knife to clean up the base of the bowl. You can see in the photo above that the bolts came up with the bowl because the nuts had worked loose enough so that the rectangular bolt heads turned and released from the flange. This is the messy part. Stuff a rag in the flange if the smell is too foul. Basically, you need to remove the remnants of the old ring being careful not to let any fall into the sewer pipe, as well as cleaning the area around the base. Remove the old flange bolts and insert the new ones. Install the new wax ring in the flange, wax side up. Now comes the trickiest part of the job — setting the bowl onto the bolts. The problem is that the bolts are a bit wobbly and you can only see one side at a time. If you dont have a helper, it might take a couple of tries. Its time to run the nuts down on the bolts, but you dont want the bolts themselves to turn. To accomplish this, start the nut down an inch or so while holding the bolt with your fingers. Then you can grip the top of the bolt with the Kleins. Still holding the bolt, tighten the nut down with a wrench. Next, set the tank on the bowl and bolt it down. It feels wobbly at first, but it will snug up nicely. Wrap the valve threads with Teflon® tape and screw the supply line on. Turn the water on by turning the valve counter-clockwise. While it fills, keep checking for leaks. Tighten as needed. Give it a test flush. Finally, replace the tank lid. Do you have any toilet wax ring replacement tips? Share them in the comment section below. Website © 2012 Kelly Smith; All rights reserved; content may not be copied, rewritten, or republished without written permission.